One of my secret New year’s resolution, scribbled in the back of my head during this year’s quiet celebrations was the one of keep the discovery-fire alive. It’s often the case that when you establish yourself in one place you are overtaken by a lethargic reluctance to discover its surroundings. As if just because you live there the seduction of nearby places gets lost and we look instead at faraway destinations for excitement. The grass is always greener. Now we have settled here in southern Ecuador and I often find myself penciling on an imaginary note all the destinations I would like to visit. Cuba, Mexico,Colombia,India. Sometimes my mind wonders all the way back to Europe with a suitcase full of memories and desire to discover all the places I haven’t yet visited. But what about all the hidden gems of Ecuador? And its multiple indigenous cultures nested within its relatively close confines? And all the festivities and traditions? Pawkar Raymi, the blooming festival, was on my radar as the perfect kindling material to re-ignite the desire of our local explorations. 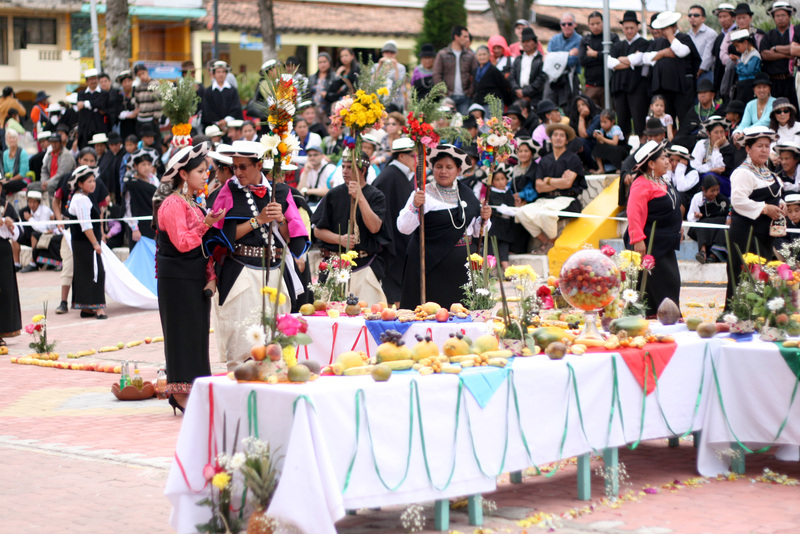 It is one of four main pagan celebrations in the Andean culture, each related to an equinox, in this case the March 21st equinox. 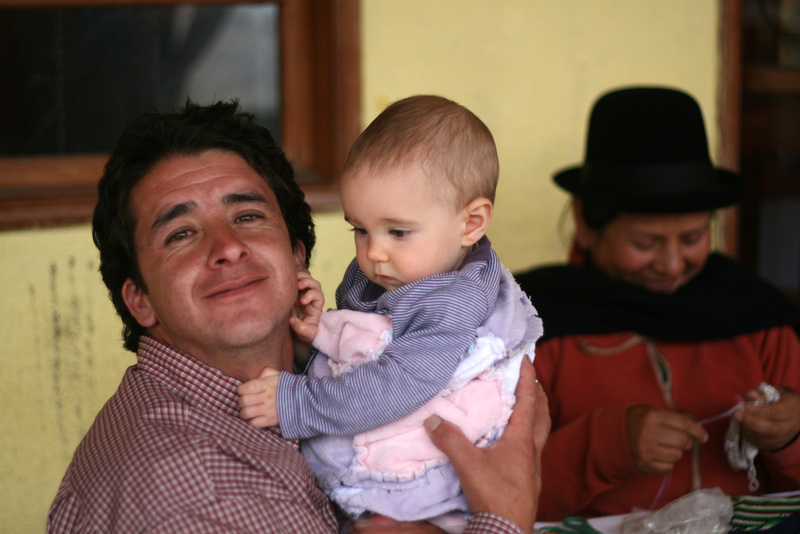 The event took place in the quaint town of Saraguro, just over 2 hrs from Vilcabamba. The area is named for the indigenous Kichwa group who lives there, also called Saraguro. In this ritual celebration, they thank the Pachamama (= Mother Earth) for giving the first fruits of the year (corn, melloco, potatoes, beans).Various events including purification baths took place the whole week prior to the main even on the 21st which is the one we arrived just on time to witness. 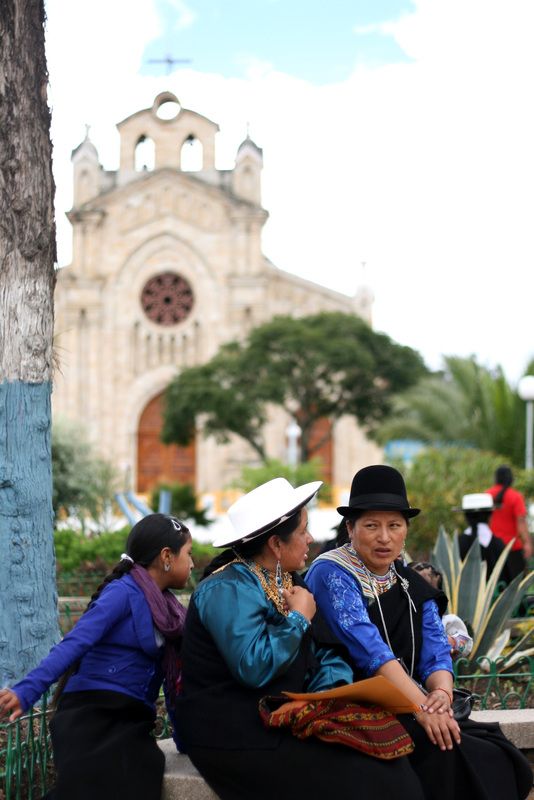 We parked just by the main square opposite the church where a big Chacana-shaped altar was created by creatively arranging grains, flowers and fruits. Coloured scarves were also incorporated to represent the four areas of indigenous belief: yellow=sun, green=nature, red=earth and blue=sky. 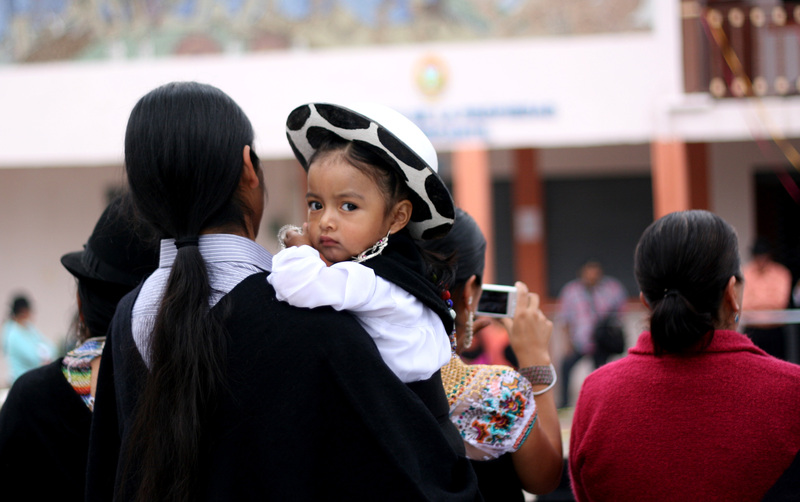 Pawkar Raymi involves the passing of responsibility for the protection of the land from one leader to another. A priest led the blessings to Pachamama, stopping once at each of the four cardinal directions to blow a large shell (which by the time he reached south lost its oomph and was producing a more fart-like sound than the powerful honk at the beginning). He blessed bouquets of flowers by spraying some sort of alchoolic drink upon them with his mouth, in the same way he did on the crowd. The smell of church incense being burnt all around the altar summoned memories of my church-going days and the mix feelings of dread, nostalgia and comfort associated to it. The cold marble of the altar, the smell of candles burning along with the hopes of those who lit them, the echo of footsteps and all sounds and whispering of pious grannies reciting the Hail Mary, the light shining through the stained glass round windows at the top of the church, the white envelopes placed on each chair asking for donation for the church renovation which I have never witness in my 20 years living there. Being part of a pagan rite was actually quite comforting. 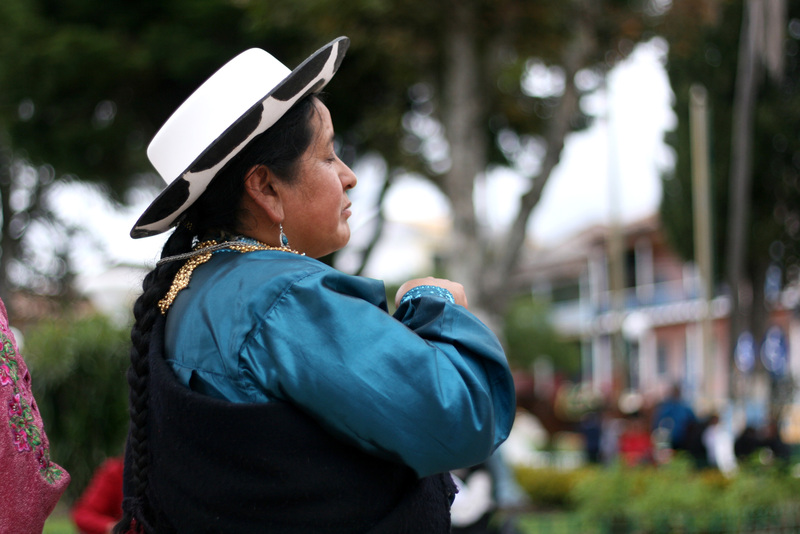 The Saraguros are known to be the only indigenous group in the province to have successfully survived the Spanish conquest and remain the best-preserved indigenous group in all of Ecuador. However, I can see, they have succumbed the Catholic bible-bashing brainwash. Many of them, in particular from the village of Selva Alegre, have been migrating to the Vilcabamba Valley and especially in the neighbourhood of Mollepamba where we live, in search of higher pay, more productive lands, a more temperate climate. We employ a few of them for work around our coffee plantation and gardens. Once, Carmen couldn’t come to work. She attended instead a procession from the Vilcabamba church where they carried its Virgin Mary up to Mollepamba (a half hour walk) where they held a mass in the fields, praying for rain as at the time we were going through a particular dry patch in what was meant to be the rainy season. Their social structure seemed to have been conserved and it’s particularly noticeable in their outfit. 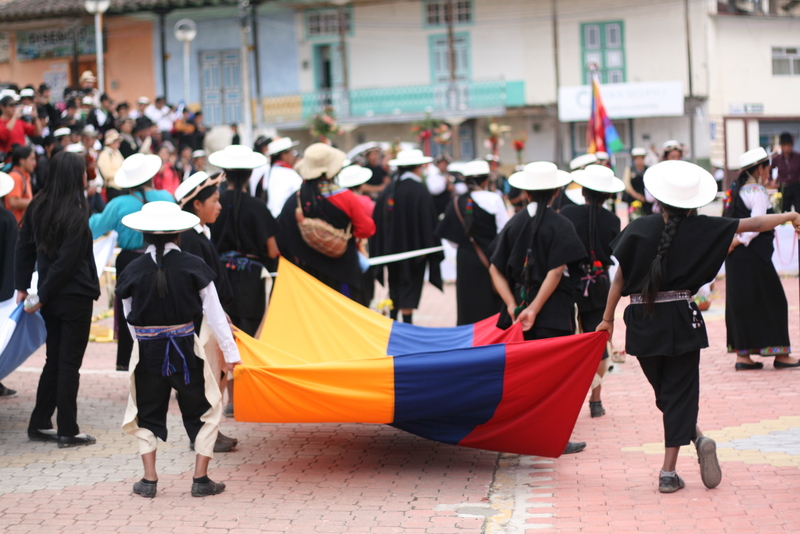 Men wear ponchos, knee-length pants and brimmed black hats.Women wear long black pleated skirts, black shawls, multi-stranded beaded necklaces and bracelets, and black hats. Both men and women wear their hair in one single long braid or ponytail. On this festivity though, many of them wore the traditional wide-brimmed white hats with a spotted pattern under the brim. Maybe because of the special occasion? I asked a few people but no one could give me a real answer. A few kids I was sitting next to were complaining about the heat as the discomfort of this hat. They allowed me to hold it. It was bloody heavy! And hard. It turns out it is made of sheep’s wool and then hardened with corn starch which turns it of a similar consistency of plastic. Amongst this community, Camila was obviously standing out even more. I was taking pictures of women and their beautiful necklaces and silver and they were taking pictures of Camila. She even befriended the husband of a lady who was making and selling these gorgeously intricated beaded jewels and this confirmed my enthusiasm of living in this exciting country. 24 Mar	This entry was published on March 24, 2015 at 11:00 am and is filed under Ecuadorian culture, Travelling. Bookmark the permalink. Follow any comments here with the RSS feed for this post.